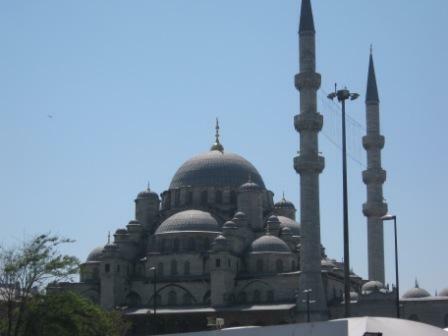 Peter has sent us a few photos from the Olympiad in Istanbul. Currently the mens team after 3 rounds have 3 points out of a possible 12 ( 0.5:3.5 Germany, 2.5:1.5 Nepal and 0:4 Paraguay). The best individual result is a draw achieved by Nicolas Croad against German GM I. Khenkin with a FIDE rating 401 points higher. The womens team have played 2 rounds and have 3.5 points out of 8 (0:4 USA, 3.5:0.5 Netherlands Antilles). The club welcomes Daniel Davis as our newest member. Daniel recently played in the recent Waikato Open and scored 2.5 in the under 1800 division. Like our other junior members his chess is making some of the older members work hard to maintain their dignity over the board. Recently we have been adding a new member every one to two weeks so the future for the club looks bright. 1. No re-match on a particular night: 1 game, 1 result only to count. 2. 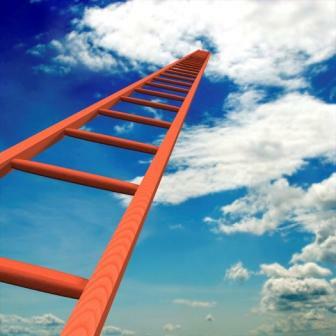 If your subscription remains unpaid for more than a few weeks you will slide to the bottom of the ladder. Currently Colin Barrett Hogg occupies the top spot on both ladders, and given his relative rarity at the club of late, he might stay there for some time !! The pundits were guessing who the “Mystery Guest” was going to be at the club night on Tuesday. Turns out that that Ian had organized a “Grim Reaper” tournament and that the Mystery Guest was none other than the Grim Reaper himself (sort of). The tournament attracted 14 players and was a handicap knockout blitz that was eventually won by Micheal Freeman following a tense last round against Peter Hulshof. Players were allocated a certain number of lives at the start of the tournament based on NZCF rapid rating, losing one life for each lost game, and being eliminated when they had no remaining lives. 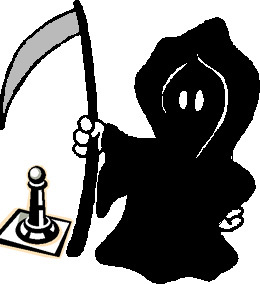 The “Grim Reaper” was Shredder playing on an 1800 rating that acted as the opponent to the odd man out when there were an odd number of players in a particular round. Needless to say nobody survived their tussle with the reaper who served well to clean up the stragglers. The tournament was quick fire, went to seven or eight rounds, and was generally enjoyed by all. Next time I think we will amend the rules such that if any two players get paired against each other in two consecutive rounds then that round is re – drawn to avoid the repetition. And perhaps the arbiter should start with a few extra lives as well. The club welcomes Graham Nolan as its newest member. Graham performed strongly at the Waikato Open recently gaining 3.5 points out of 6 in the Open division, and will be a strong contender in future local tournaments, and in the club champs and rapid next year. We tied with our best ever previous turnout for the Rookies today with 30 competitors. Special kudos to those that travelled from as far afield as Rotorua and Auckland to take part. First overall was taken out by Benjamin Symon –participation in club night games has increased his ability in the last few months and he will be giving big brother Christopher a run for his money soon. Second and third went to club members Murray Tuatini and George Tuwhangai. Age division first and second prizes for U16 U14 U12 U10 and U8 were also awarded – the final crosstable and full details of all prizewinners and the tiebreak points can be found here, and these are the photos. Special thanks to Hilton for giving a simul against 6 players during the lunchbreak – hopefully we can provide the same challenge at next year’s events. This was the last rookies tournament for 2012 but we look forward to seeing you all again next year when maybe we can get to 40 participants.